Juha Alakarhu, in charge of Nokia's digital imaging, gave a lengthy interview at CES, commenting on many things around Nokia's groundbreaking mobile imaging achievements we witnessed last year, such as PureView Phase 1 in the Nokia 808 PureView, and Phase 2 in the Lumia 920. Unfortunately, just like in the interview yesterday, he was light on details about the goods we can expect from PureView phones this year, as the competition is watching and listening, but he did say great things are coming, and, seeing the results so far, we are inclined to believe him. One very important piece of news for Nokia Lumia 920 owners also came out of the interview - the update that fixes the somewhat "softish" photos coming out of a camera that is otherwise great in low light shots, will be "one of many," and PureView Phase 2, as present in the 920, will keep getting ironed out and improved. Thanks for the post on that info!!!! Rather than create a new thread for an article which, to me, is good news for Nokia+WP8 overall, I'll post it in your thread. While, the article doesn't indicate Nokia is well on it's way as the clear winner of a 3rd option in the world of smartphones, it does show some positive/encouraging response to the Lumia device itself, it's not only the 920 but the 920 is mentioned. *apologies if someone else already posted this or a similar article. Didn't check the full board before-hand. speaking along the lines of your link damon, here's an article from wmpowersuer.com with stephen elop talking about how the lumia 920 could have sold more if the hardware shortage wasnt there. In a conference call with leading investors and analysts, Stephen Elop said their Windows Phone sales could have grown even faster were it not for supply-side issues. "For example, AT&T and the 920 had significant supply issues with us during the course of the quarter," Nokia CEO Stephen Elop said during a conference call. It was however not just under-ordering by Nokia, but also shortages of key components which limited supply of the handsets. "(We are) working with suppliers and operators to work through the situation today," Mr Elop said. The shortages also prevented Nokia from being able to discount the handset as they traditionally would have, a situation which will presumably improve as supply increases. "Other parties may be making decisions to drive traffic or to change behavior….But broadly speaking, this hasn’t been a price discounting environment." He said Nokia did not expect to sell any significant number of Symbian handsets in Q1 2013, leaving their Lumia handsets as their only smartphone OS. "We have to make steady progress quarter-on-quarter-on-quarter. Obviously, getting off to a good start with Windows Phone 8 was important in that journey and I think the results today reflect the fact that first step is something we are quite pleased with," Elop said. Cool, thanks for adding that article to your thread, tebugg. I think it's definitely no secret that at the core, sales have been drastically impacted by the limited quantity of the 920 for months since it's launch. The optics are definitely there, the video quality on the L920 rivals my Canon Vixia HG20. 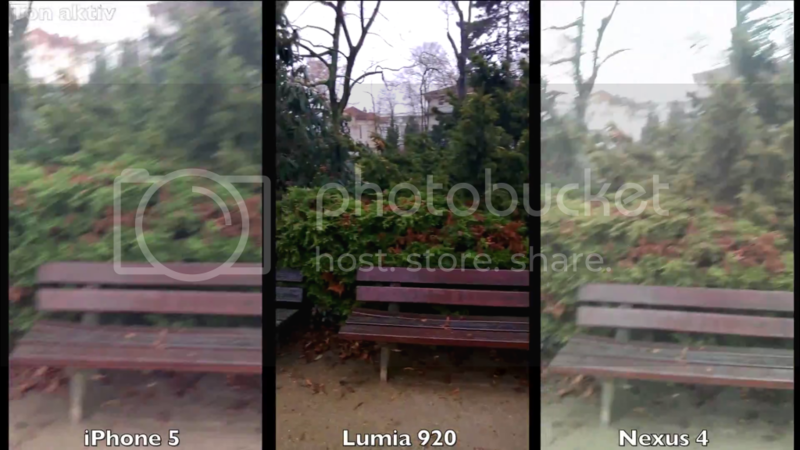 Someone posted a video comparison and I was amazed at how well the lumia 920 preserved it's image quality during motion. I paused the video at different segments and took screenshots, it almost seems unfair! Here's a link of the video and screenshots below. But anyway, I can't wait for the next update that improves the day time shots. If videos are some much sharper than any cell phone out there, photos can be too. Click here to view the original image of 1024x576px and 554KB. Click here to view the original image of 1024x576px and 706KB. Click here to view the original image of 1024x576px and 573KB. 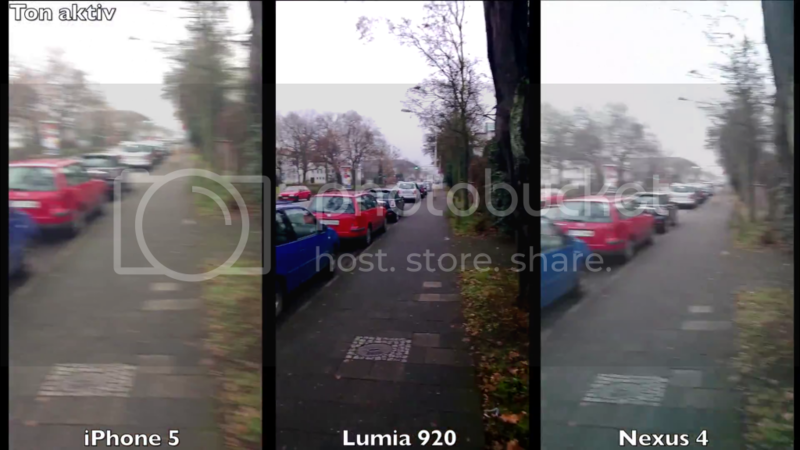 excellent video demonstration, you can tell where the 920 can improve though. There are quite a few points where it over compensates colours. I have noticed this on mine a little also, but you can really tell in that video. 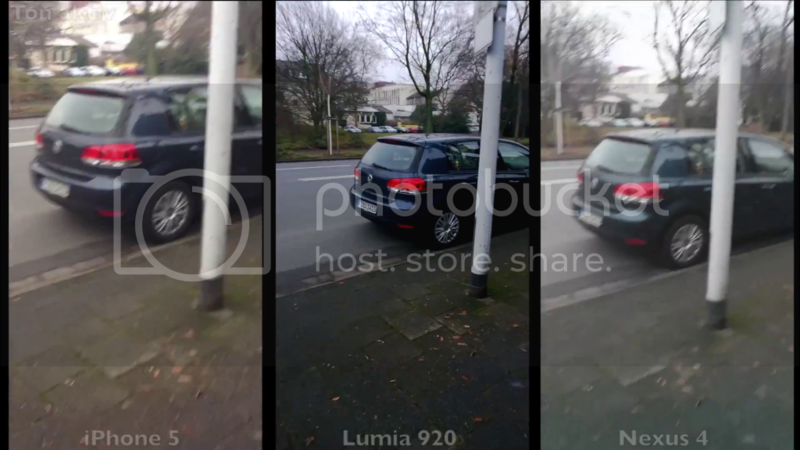 here's a video done by someone with a camera video comparison between the lumia 920 and iphone 4s (which has the same camera as the iphone 5). Lumia 920: Beautiful colours, a fairly well detailed and wide angle very appreciable. iPhone 4s: Pretty details, colours very bland and zoom video quite embarrassing. Lumia 920: In yet very beautiful colours, a very detailed picture in the centre and very blurred behind. iPhone: The iPhone on the ACTUAL colours are less attractive but the foreground is less detailed and the back plane anymore. iPhone 4S – Dry but still colour is largely the same. The picture is more detailed but less homogeneous in the centre. iPhone 4S: Same problem as the Lumia 920. The iPhone has completely off exposure. The angle is really reduced. Lumia 920: The picture says it all even, beautiful colours, a very wide angle. 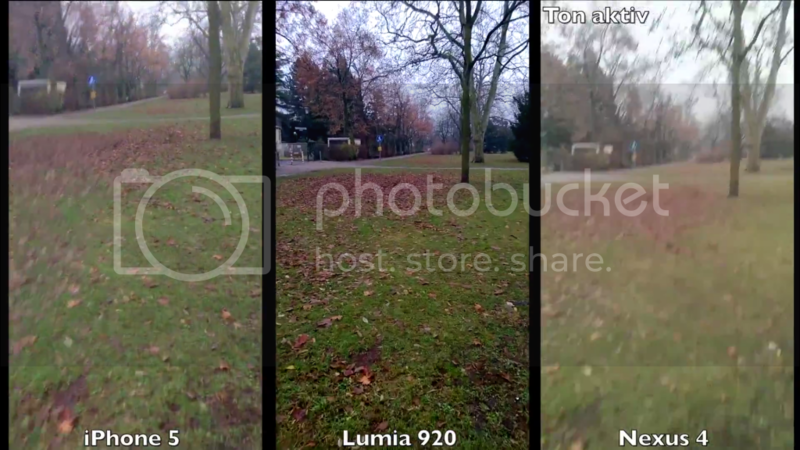 so basically the lumia 920 camera is better. 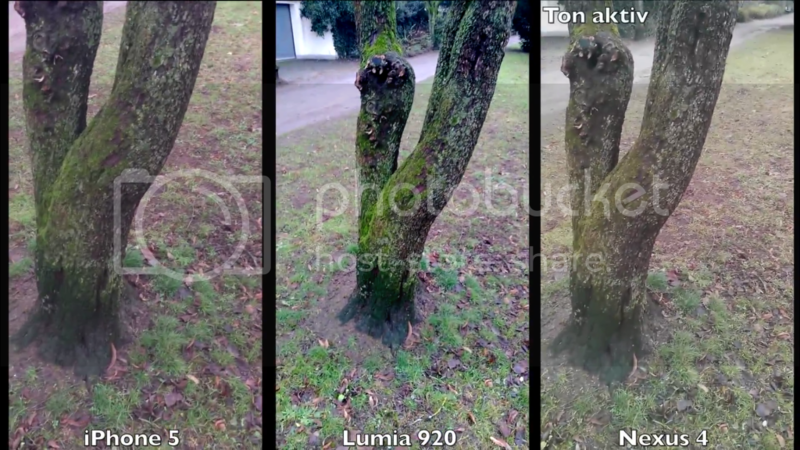 disclaimer: dont hate me lumia 920 haters. just bringing positive news to the forum!